Algae are some of the planet’s most ancient life forms. Human consumption of algae (spirulina) dates all the way back to the Aztec civilization of the 14th century, where it was harvested for food and medicinal purposes. Microalgae, the category most often used for nutraceuticals, are tiny photosynthetic organisms similar to plants. They contain chlorophyll and feed themselves through photosynthesis, taking energy from the sun and converting it to sugars and proteins. Their home in nature’s waterways, often under intense conditions, have caused algae to evolve some very powerful health benefits. The global supplement industry was valued at $132.8 billion and is expected to grow at around 8% per year, an interesting prospect for new players like microalgae experiencing periods of growth and product recognition. One report has spirulina’s market size growing to $170 million by 2025 with a CAGR of 4.5%. From protein-packed spirulina, to nutrient-rich chlorella, to astaxanthin’s impressive antioxidant properties – microalgae are becoming well-known as the super-nutrient of the future. The same substance that gives salmon and krill oil its pink colour also happens to be one of nature’s most powerful antioxidants, anti-inflammatory agents, and ally in overall health. One of nature’s most powerful antioxidant, astaxanthin is 6,000 times stronger than vitamin C.
Strong anti-inflammatory properties, red algae astaxanthin reduces various inflammatory responses known to cause pain and inflammation. Can help prevent and delay cellular oxidative damage. A powerful recovery-aid for athletes, helping reduce muscle damage and lower inflammation caused by intense physical exercise. A natural sunscreen and skin protector, 11 times more powerful than beta-carotene and 550 times more powerful than vitamin E at battling skin-damaging oxidation. Skin care, joint problems, rheumatoid arthritis, cardiovascular health, protection against age-related dementia and eye conditions like macular degeneration – astaxanthin is one of nature’s most versatile and powerful allies. The word is spreading and the benefits of red algae astaxanthin are leading to increased awareness and market growth. The global astaxanthin market is expected to reach $2.57 billion by 2025 with a CAGR of 18.9%. With unique access to naturally-sourced algae, and a vertically-owned Made in Canada production facility, Pond Naturals is positioned to become a global astaxanthin leader. Clean – Our fully enclosed, biosecure system ensures our Astaxanthin is consistently made to the highest quality standard. Green – We develop and use the latest technology to minimize environmental impacts. Our facility uses 100% renewable electricity and is working towards zero waste. Made in Canada – Our astaxanthin is derived from a strong, local strain of H. pluvialis which has evolved to withstand tough northern climates. Wet Extraction – Our gentle, all-natural extraction method preserves the oil as the algae are never dehydrated and never exposed to harsh chemicals or excessive heat. This avoids denaturing common in other brands and results in a pleasant, non-fishy odour and aftertaste. 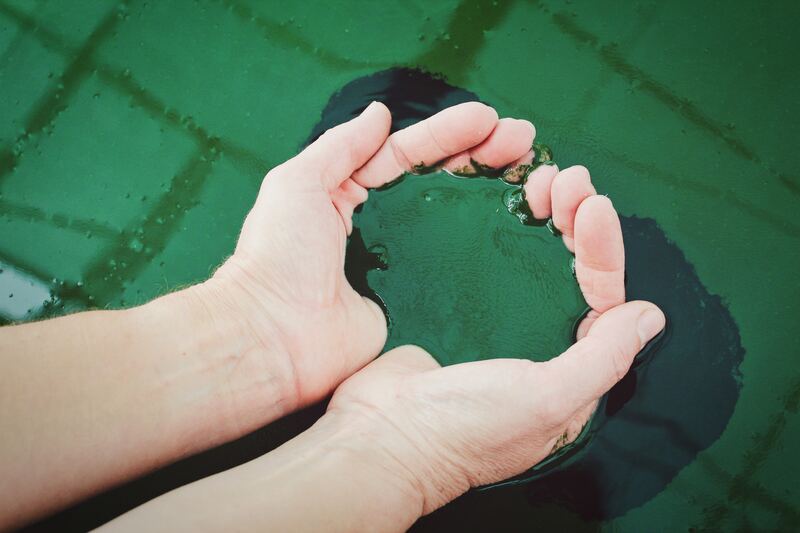 Full Spectrum – By extracting astaxanthin from whole algae, we harvest a “full-spectrum” algae oil and not just an isolate that cuts out other nutrients present in the algae cell. Anecdotal evidence from consumers points to a more potent and effective end-product. While Pond Naturals is pursuing clinical astaxanthin trials, a previous study on cannabinoids found similar benefits in full-spectrum CBD oil when compared to CBD isolates.